little encouragement from employers to secure an M.B.A.
Oh, the poor little dears! I used to buy those arguments, but not any more. Today, I would argue that there are more than enough role models and support structures and mechanisms in place to help women achieve the success to which they would aspire IF THEY WOULD BUT PURSUE THEM. If I can find these inspirational women, then other young women can find them and follow their lead as well. In separate blogs and articles on this web site, I have described Female Thought Leaders, Female Writers of Old and of New, and Female Advocates who are re-writing the book on how to get women on corporate boards of directors in Norway. And here, I will add about a half a dozen pages of inspiration from female leaders in Great Britain. It's time that we, in the United States, take a cold hard look at what WORKS vs. what does NOT WORK in terms of helping women advance to leadership roles. Any maybe we could begin by stop listening to our American Fourth Estate tell us the same old Little Corporate Stepford Wife Message that keeps women silent in the kitchen or in the shoes stores of our local malls. Maybe American women could get out and look at the lessons and opportunities that are being generated by our Sisters Around The World. 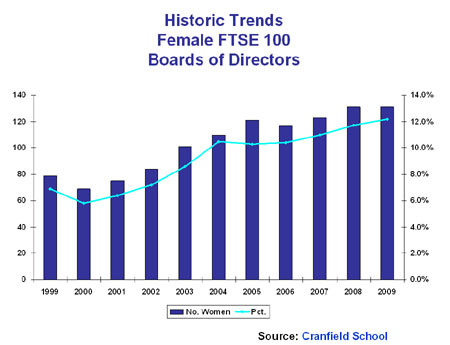 And for all of the complaining, there are two very important points to be made about the progress of women on boards in the U.K. First, women have been added to top FTSE 100 boards at a slow but steady pace as shown in the chart below, showing the number and percent share of women directors for the past 10 years. Women directors increased from 79 to 113 over the past decade, showing an increased share even during the current recession. 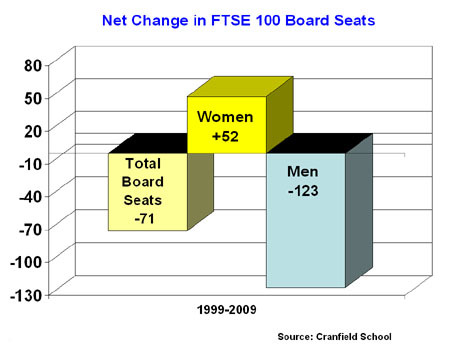 To quote the Cranfield report, "There are now 2,281 women (up from 1,877 last year) on the corporate boards and executive committees/senior teams of all the FTSE listings, hence there is a huge and growing pipeline of female talent available to the FTSE 100 boards." "The percentage of new female appointments to FTSE 100 boards has risen from last year’s 10.7% to 14.7% this year." Even more important is the fact that boards in the U.K, like in the U.S., REDUCED the size of their boards. Male directors vacated seats, while women were ADDED. Let's keep those points in mind as we look at the many programs underway to teach women about governance and leadership in the U.K.
© 2009 Technology Place Inc.